I love frittatas, the Spanish had it all right with this masterpiece. Unfortunately, I manage to make it into scrambled eggs deluxe every time I attempt it, so I resort to the French version, quiche. I enjoy a crustless quiche during my Monday through Friday routine. It doesn’t weight me down, packs a punch with veggies and protein, and it takes a minute to warm up in the morning. P.S. This is also wonderful as dinner. Serve with a side of lightly dressed mixed greens. 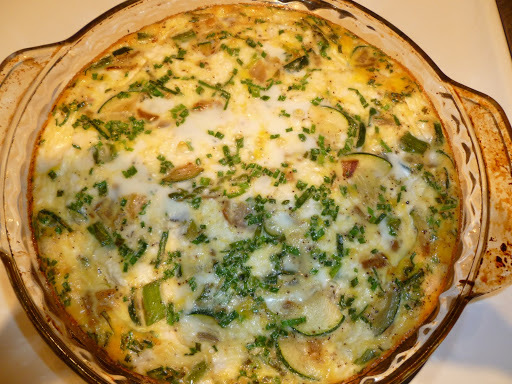 Chop zucchini, asparagus and onion into bite sized pieces. Heat olive oil in skillet over medium high heat and add veggies once the oil is warmed. Grind 1/8 teaspoon fresh pepper and 1/8 teaspoon salt over veggies and allow them to brown for about 8 minutes, stirring occasionally. Meanwhile, in a medium bowl, add eggs, milk, chives, remaining salt/pepper; whip together. Once zucchini mixture is cooked, spread into greased pie dish. Use your fingers to dot veggies with large clumps of goat cheese. Pour eggs over vegetable/goat cheese and pop into the oven for 18-20 minutes, or until center of eggs feel set. You can serve immediately, or cool, then refrigerate for up to four days. When serving, top with a little extra goat cheese and chives. This sounds perfect for my Mother's Day brunch menu which will include two vegetarians! I am going to try feta instead of goat cheese so my dad will eat it, too! Thanks for the inspiration! Hey Mary! Another winning combination is Manchego and green chilis. Hope everyone enjoys it and thanks for the comment!